Happy Friday! Boy am I glad this week is finally over (almost). It’s been quite the wild ride and I guess in a sense, this animal print skirt, with it’s bright lime color and fun zebra print, combined with a striped top for a lil’ print mixing is perfect for ending the week with. An instant pick-me-up! P.S. In case you’re wondering, this skirt is an inspired Acqua Mikado skirt with hand-printed zebras from Get The Look. It comes with a removable petticoat for added volume. Have a great weekend! LOVING this look! A new fave and that quote! OOHH. Perfect for the vibes of your editorial. 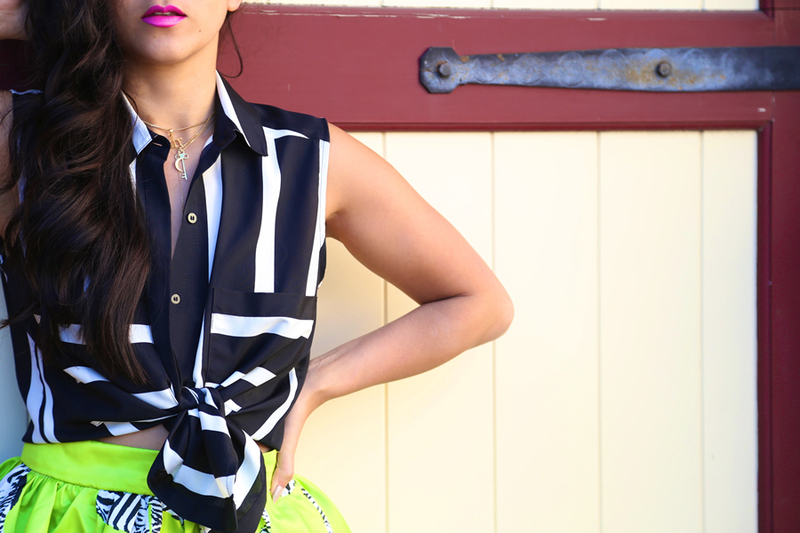 How fun and gorge is this look KT, I love your bold and daring combinations and this is one of them! Such a fun and flirty outfit! That skirt is everything! I also love those heels!! OOOH SKIRT!!! I love this! I’m in love with this outfit!! Love how you styled it with the print mixing. It’s bold het subtle and I like that you’re not over accessorized! Can you tell me if you are wearing the petticoat? Your outfit is super awesome. Love the skirt. LOVE this look! The mixed prints are perfect! This outfit is amazing. I love the mix of patterns and your skirt is everything! I love the pattern combination. Gorgeous!